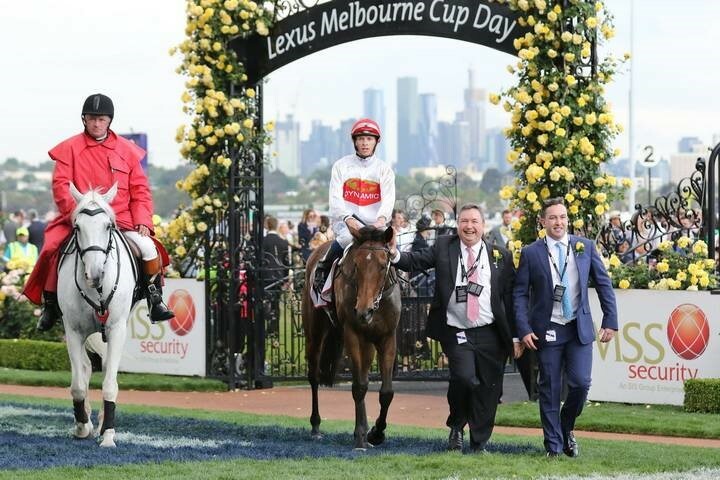 It was the closest race of Melbourne Cup day, a photo finish being used to ensure the correct result as two mares, wide apart on the famous Flemington surface, fought out the finish. When the photo was revealed, Dynamic Syndications tremendously talented 4yo mare TELEPLAY (Written Tycoon x Special Episode by Redoute’s Choice) was a clear winner with a Head Margin in the MSS Security Sprint, an open company LISTED RACE, run over 1200m upon the famous straight six 1200 metres layout. TELEPLAY reeled off the fastest last sectionals to swoop and score over the Matt Laurie trained Moonlover with Holbien back in third spot whilst favourite Trekking was 4th. The jockeys elected to steer the race down the centre of the track, rather than over on the rail or near the grandstand. TELEPLAY is trained by master horseman MICK PRICE and was ridden to perfection by MICHAEL DEE. TELEPLAY who had a noted tendency to be slow into stride, was away smartly in this event and settled just behind the leaders in a bunched field over the first 400m. First Among Equals and Moonlover challenged for the early lead setting up very slick early sectionals on a surface that was rain effected after massive storms earlier in the day. At the same time, Tversky (Dale Smith) a 5yo gelding from barrier 17 came over to sit at our girth, on our outside. Disappointingly that rider lost his compass and crunched into TELEPLAY several times. Stellar Collision (aptly named) 5yo gelding was on our inside and he wanted to push out causing TELEPLAY to be buffeted around like a pinball. At the 600m, TELEPLAY was cluttered up mid-field 4 lengths off the leaders and racing tight in traffic. A lesser horse would have put up the white flag at that stage of the race. TELEPLAY was 3 pairs back in running at the 500m tracking 4yo gelding Holbien who in turn was tracking 7yo gelding First Among Equals. At the 300m, Michael Dee angled TELEPLAY out of the ruck and to the outside of Holbien who, when TELEPLAY got to its shoulder, ducked out costing TELEPLAY momentum as she was hampered. As they passed by the furlong post, TELEPLAY was gathering momentum but was still back in fourth, 2 lengths off the lead. TELEPLAY is motoring down the outside with two strides to go ! Moonlover, the last start winner of the Black Pearl Stakes, a Listed Race at Geelong (the race which TELEPLAY had also contested when we were beaten 2.1 lengths having raced without any luck), and Holbien appeared to be full of running heading into this final 200 metres but they couldn’t hold out TELEPLAY who swooped with the fastest last 200m of the race and aided by a well-timed drive to the finishing line, arrived in in the shadow of the finish post to claim the win by a head and earning her Dynamic Owners the $90,000 first prize. TELEPLAY has the field well strung out ! Connections of TELEPLAY were always confident their gutsy mare would be competitive and finish in the mix but to claim victory of the MSS SECURITY SPRINT – a LISTED RACE over 1200m (registered race name is the ALWAYS WELCOME STAKES) was a dream come true and it’s even more satisfying, when the race is on the Melbourne Cup Programme. TELEPLAY met with support late in betting, firming from $26 into $18 over the final 2 minutes before the jump while runner-up Moonlover was an $8 hope. Such was the dominance of this win, it can be summed up by the sectionals. FIRST AMONG EQUALS ran the fastest in 10.19 secs. TELEPLAY also recorded the FASTEST final 600m Split 34.34. This was 0.69 secs Faster than the 35.03 they clocked overall in this race. TELEPLAY also recorded the FASTEST final 400m Split of 23.60. Further, TELEPLAY did this feat as the worst rated horse in this event. She was only a Benchmark 69 rating and in this race, the Top Weight was a Benchmark 105 rating and the first seven runners were all rated between 105 – 95. That meant TELEPLAY was rated 36 Benchmark points lower than the Top Weight COMICUS who carried 60kgs. As a Benchmark 69 TELEPLAY’s True Weight would have been 18kgs less than Comicus – therefore she would have been allocated only 42kgs. However with a 54 minimum handicap rating she was asked to carry 54kgs which is 12kgs more than her True Weight. Another example of being poorly weighted was against the runner-up Moonlover. Last start they both met and Moonlover (56kgs) beat TELEPLAY (55kgs) by 2.1 lengths. In that race TELEPLAY received a 1kg less weight. Moonlover carried 56kgs and TELEPLAY carried 55kgs. Moonlover won that race (a stakes race) and was now a benchmark 91 rated mare. TELEPLAY was unplaced in that same race and was a benchmark 69 rating mare. That’s 22 points which equals 11kgs difference under True Weights scale if these two had met in a Mares handicap. Yet in this event against the males, both mares carried 54.0kgs. So Moonlover, having won the previous stakes race, under these race conditions, dropped 1kg to sit at level weights with TELEPLAY. That difference in true weights highlights the massive task TELEPLAY had to accomplish – and she did it ! She is now punished for her win and became a Benchmark 95 jumping a massive 26 rating points which equals 13kgs. However Moonlover who has won 9 races and is a Stakes Winner and Stakes placed in her past two starts is only a Benchmark 94 ??? However the positive is this will ensure she is now a high enough rated mare to gain entry into almost any stakes race assignment that she will be on given on in the Autumn. 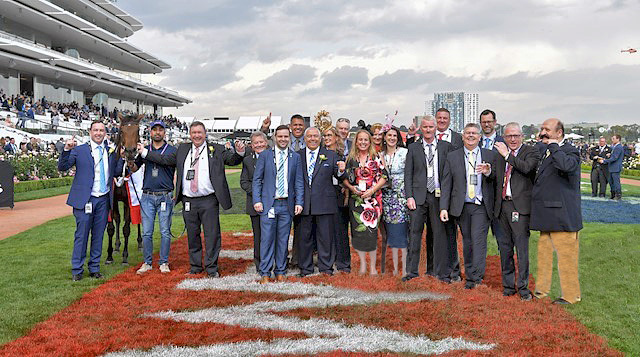 Our big team of Dynamic Syndications owners had plenty to celebrate. TELEPLAY had previously raced on 5 occasions for 2 wins (Ballarat and Kilmore) and 2 city placings (Moonee Valley and Caulfield) and a desperately unlucky last start result when finishing 8/10 in a Listed Race at Geelong beaten 2.1 lengths without having a clean run in transit until after the race was over yet she still ran the fastest sectionals of that race. TELEPLAY was just facing the starter for her sixth time. She was giving away class and experience to her more seasoned rivals, and her first attempt up the straight, but nobody told TELEPLAY that. She unwound a powerful finish for her rider Michael Dee to score a head win. "I was quietly confident coming here today, especially with the wet conditions," said Dee, who had ridden TELEPLAY in three of her previous runs. TELEPLAY with her new rug ! An $85,000 Inglis Premier purchase from the Baystone Farm draft for Dynamic Syndications/ Dean Watt Bloodstock, Teleplay has now won three of six starts with a second and a third and has earning $168,450 in prizemoney. TELEPLAY will now be aimed exclusively at Stakes Class racing. 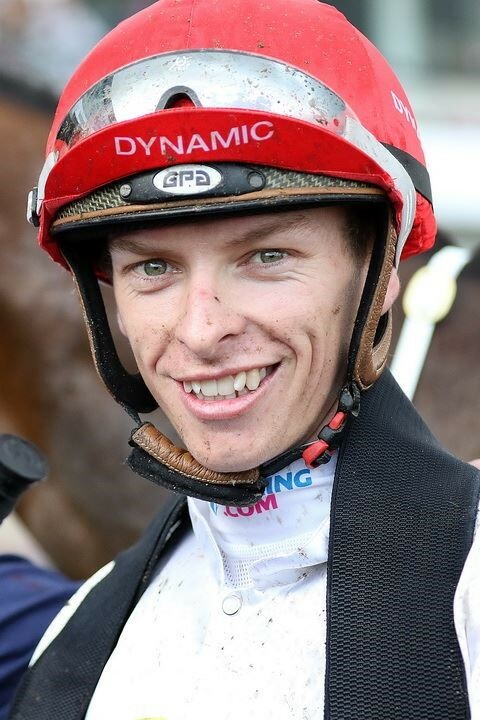 Trainer Mick Price was interviewed on Racing.com and said: "Credit to Dean Watt, who rang me about getting her into some of these little Black Type races and it's paid off. "She's a game mare and is now a valuable mare." Most importantly, TELEPLAY is now worth over $500,000 as a broodmare upon racetrack retirement. TELEPLAY is a half-sister to stakes-placed Astro Flame and she is the best of three winners to date from Special Episode (by Redoute’s Choice), a winner at 1200m and a three-quarter sister to Group 1 Winner First Seal and Group 2 Winner Book Of Kells. TELEPLAY’s Grand-dam is the dual Gr1 Oaks Winner - Episode. TELEPLAY became the 25th stakes-winner for Woodside Park Stud's Written Tycoon, who has earned the right to become Victoria's most expensive stallion at a service fee of $110,000. 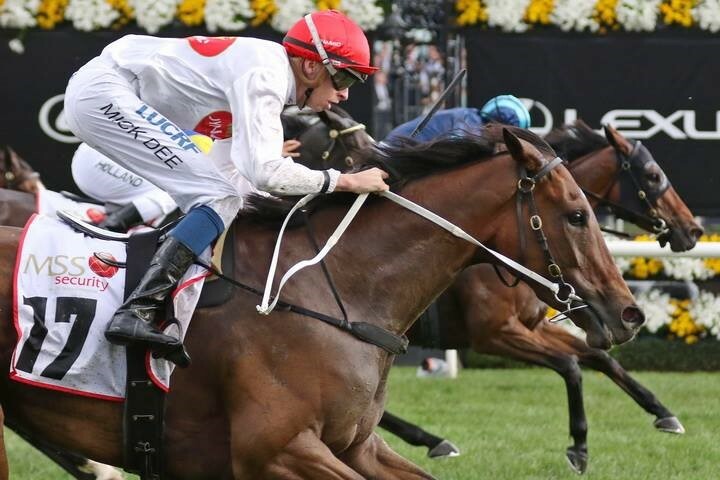 TELEPLAY pulled up sound but the run was tough so without any other suitable options available, Mick Price wisely sent TELEPLAY to the spelling paddock for the balance of the spring so she may be aimed at the smart Black Type races in the Autumn. TELEPLAY’s win was celebrated with scenes of jubilation and triumph by the large contingent of her Owners on hand who were still feeling that euphoria when they greeted her upon entering the Winner’s Circle. TELEPLAY OWNERS + SPONSORS + MICK PRICE enjoy the might mare's success ! TELEPLAY winning the MSS SECURITY STAKES (LR) recorded DYNAMIC SYNDICATIONS 12th Win for the season and our 554th Race Win since 2005.